A vacuum hold down feature can be incorporated into a table to hold individual sheets of plywood in place while you machine scarf bevels. This feature works especially well when using the router box technique described in the scarffing article. You’ll need a fairly large vacuum pump. We use an oilless rotary vane vacuum pump made by Gast, Model No. 3040-V115A. It generates 25 cubic feet per minute (cfm) at no vacuum and 5 cfm at 20″ of mercury. Smaller units may work, but lots of cfm and reasonably high vacuum are required when plywood is warped or rough. A vacuum table will work most efficiently holding down smooth, flat plywood panels. To build this feature into a table, start with one that is smooth and flat. (Plastic laminate tops work especially well.) Starting 1″ back from the edge of the table, drill a series of 3/16″ diameter holes spaced about ¾” apart. Drill three more sets of holes ½“, 1″, and 1½” back from the first row. Stagger the holes in each row from those in the previous row. These will provide points of vacuum to pull the plywood sheet against the table and hold it in place. From beneath the table, cover the holes with an air chamber to complete the vacuum manifold. We made ours from 3″ diameter, schedule 40, PVC pipe. First, cut the pipe to match the table width, minus 1½”. This will leave room for the end caps that will be glued to the ends of the pipe. Then cut the pipe in half along its length and set one half aside. Use sand paper to scuff the edges along the length of the pipe before applying adhesive. Bond the pipe half to the bottom of the table with WEST SYSTEM 105 Resin and 205 Fast Hardener, thickened with 404 High-Density filler. Center the pipe over the holes and take care to keep the adhesive mixture out of them. Form a small fillet along the edge of the pipe. When the epoxy cures, drill a hole in the bottom of the pipe near one end and install a ¾” female PVC adapter. Seal this fitting with epoxy or silicone sealant. Use ¾” PVC pipe to connect the vacuum pump to the vacuum manifold. 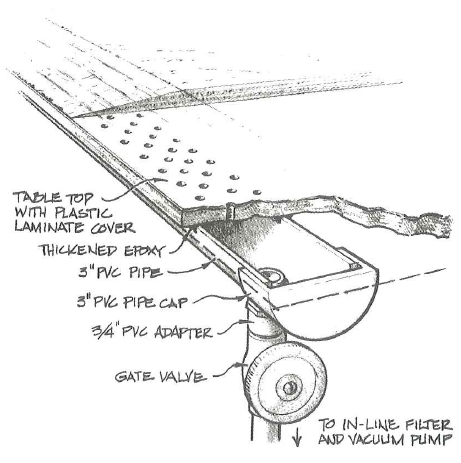 Installing a gate valve in the line near the end of the table makes it easy to shut off the vacuum before removing a panel. If the plywood panels are warped, hold the plywood flat against the table with your free hand as you turn on the vacuum. This will close the vacuum loop so the panel can be pulled tightly against the table. Occasionally, plywood having course grain or rough peel veneer will resist drawing flat against the table because air leaks past the channels in the grain. To complete the vacuum seal, apply masking tape along the edge of the plywood around the end that is over the vacuum chamber. This will allow the panel to be pulled tightly against the table. You can vacuum panels that are smaller than the full width of the table. Simply seal the exposed vacuum holes with masking tape or strips of cardboard. Holes left uncovered will reduce vacuum in the chamber, possibly allowing the panel to move while machining. The sawdust generated while machining can damage your vacuum pump. Be sure the pump is protected with an in-line filter that can be easily accessed for cleaning. This entry was posted in Composite Fabrication, Shop Tricks and tagged #7, Epoxyworks #7, Spring 1997, Tom Pawlak, vacuum bagging on May 29, 2014 by ewadmin.